Hi! I sure love sticky saucey things. You should too. So we're kind of eating healthy, so no desserts or anything. Sadfaces. The good news is that I made this tempeh and it was delicious. Remember last time I made tempeh and posted about it? Tempeh is kind of boring by itself, but crisp it up in a pan and coat it with a sticky sauce and it's a delicious thing you should eat. This is Lightlife brand garden veggie tempeh. This is a super easy recipe. 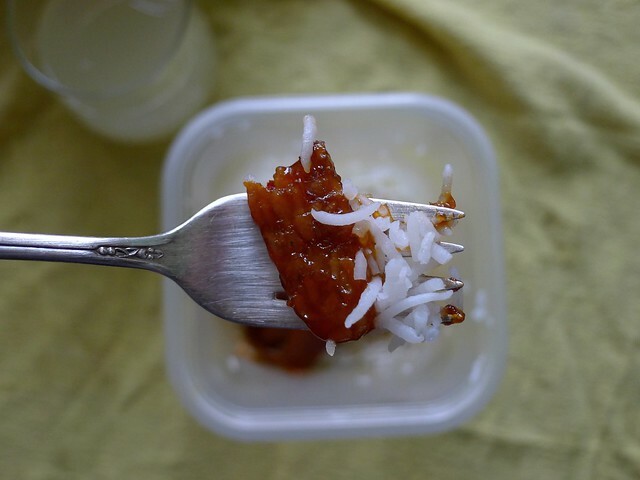 All you do is crisp the tempeh and pour over an easy quick bbq sauce that can be whipped up in 1 second, let it cook for a minute or two or five to thicken the sauce and make it stick, and you're done. I served it over rice, with a side of kale chips. 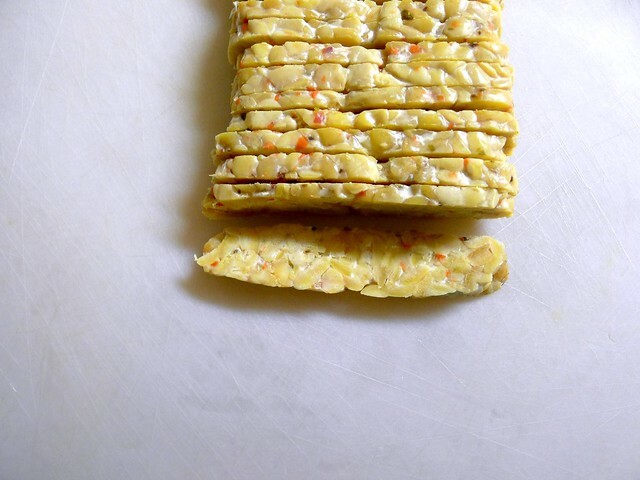 Slice the tempeh about 1/4" thick. Heat enough oil to lightly cover the bottom of the pan you're using over medium-high heat, and toss in the tempeh. Cook for a few minutes on each side, until well browned and crispy looking. While that's happening, whisk together the brown sugar, ketchup, vinegar, mustard and hot sauce. When all the tempeh is crispy, pour over the sauce mixture and reduce heat to medium. Simmer for a minute or two or three until the sauce thickens. Serve over rice, or on a sandwich, or whatever. Yum! I always adore your recipes! I'm actually eating some tempeh for my dinner tonight. I topped it with some hot wing sauce. For some reason I just love that red sauce. I'll try BBQ sauce next time.